When even LeBron James, an NBA megastar, can be a target of racism, my take-away is that insecurity is behind the hate. Posted on June 27, 2017 by Loudspeaker Films presents TEACHED and filed under by Zachary Dorcinville and tagged hate crime justice racism. When President Obama was elected back in 2008, I was elated because I had a feeling that our country was entering a brand new era in which equality would be a priority. Fast forward to 2016, and it's a totally different ball game. Posted on December 14, 2016 by Loudspeaker Films presents TEACHED and filed under TEACHED Interns, On the Loudspeaker, Race Matters, by Zachary Dorcinville and tagged zachary dorcinville teached president president obama election African American. When Will We Modernize How We Treat Each Other? Reading that at least 136 black people have been killed by police officers in 2016 (so far), and that 306 were killed at the hands of law enforcement last year, this gives me a sensation of fear and agony in my soul. The United States Constitution speaks of "We The People" and I believe our country stands for the notion that we, all people, every citizen, will be granted equal rights disregarding race or gender. Posted on July 21, 2016 by Loudspeaker Films presents TEACHED and filed under Race Matters, Juvenile Justice, by Zachary Dorcinville and tagged Racial profiling teached race equality. Justice, self-healing, and cultural expression were some of the main themes along with many others presented at the inaugural Uptown Short Film Festival last month in Harlem, NYC. I walked into the theater with my expectations through the roof, however they were still shattered by the impactful vibe of all of the films. One of the short documentary films centered around a woman who was sexually molested as a child and terrified of being involved in a relationship ever since. In search of a solution for her chronic depression and anxiety, Anita Kopacz turned to alternative therapeutic interventions and self expression, conquering fear and opening herself up to healing. This film sent a strong message to others who have been in a similar circumstance. The film that left the biggest mark on me however was "Think of Calvin", a short film by Loudspeaker Films' Kelly Amis about the harsh reality of racial profiling for African Americans (you can watch the trailer here). As the film progressed, I was easily able to identify with the crowd which was mesmerized by the provocative and surprising story. As facts were presented at the end of the film, there was a chilling effect felt throughout the crowd, me included. Film director Kelly Amis received a well deserved second place trophy at the end of the festival, and as an intern I was honored to walk up and congratulate her in a big moment. From left, Michelle Thomas, Angelica Flowers, Kelly Amis and Zachary Dorcinville. 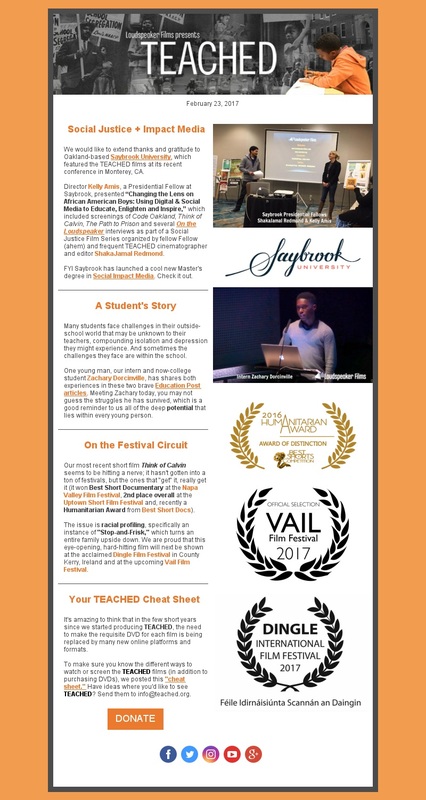 Posted on June 4, 2016 by Loudspeaker Films presents TEACHED and filed under TEACHED Interns, TEACHED Films, Screenings, by Zachary Dorcinville and tagged uptown magazine kelly amis think of calvin teached loudspeaker films zachary dorcinville uptown short film festival mist harlem. Suicide among young people is one of the leading causes of death in the U.S., and most are linked to poor mental health. Adolescents dealing with mental health issues simply aren't getting the help they need, especially in educational settings. I believe that if schools would take the initiative to incorporate mental health services for young people suffering in silence, suicide among teens would drop dramatically. Posted on November 18, 2015 by Loudspeaker Films presents TEACHED and filed under TEACHED Interns, by Zachary Dorcinville and tagged youth loudspeaker films mental health recupery coding code oakland teached.